Today, it was a struggle to find a subject to draw or paint. I had a dentist’s appointment and was in no mood. However, when I finally sat down at the desk where I paint, I noticed the sketch of my wife, I did last night. I got out the big paper and decided to paint a portrait of a person at rest. Someone like my wife, but not her in particular. However, I decided to include her neck pillow; it fails now and then, which gives her a headache. I incorporated it into the study. I began with a clear-water outline of a head; I infused lemon yellow into the left portion and blue into the right. After drying, I used cadmium red light as a glaze over the yellow and blue segments. I put in some facial features. The blue-green pillow turned to mauve as it passed into shadow. As I was working on this portrait, I thought of our niece in the other room. She is struggling with cancer. I left the painting unfinished. 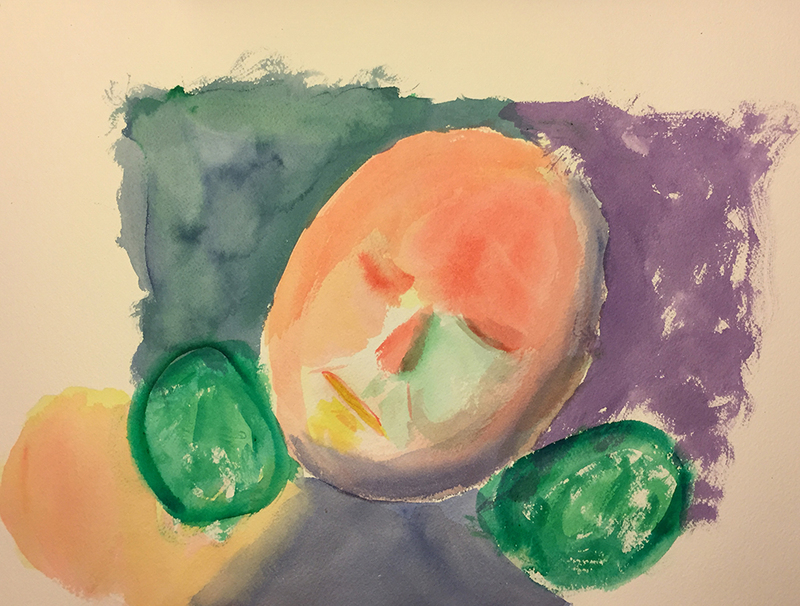 This entry was posted in Personal Stories and tagged abstract, artistic process, cancer, creative process, creativity, death, illness, portrait, sketch, watercolor. Bookmark the permalink.